Meet Chad, a real go-getter in the company. He’s also a paranoid sociopath, and probably harbors some very deep, very old anger at his mother. Chad isn’t so much a man’s man as he is a psychiatrist’s lab rat. 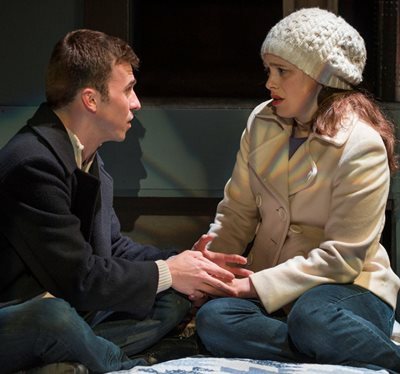 He is the cringe-inducing anti-hero of Neil LaBute’s “In the Company of Men,” now set forth with chilling conviction at Profiles Theatre. 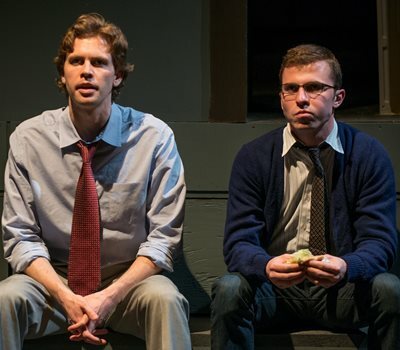 This is the official world premiere of LaBute’s revised version of “In the Company of Men,” an early play that established his career when it was turned into a film in 1997. It’s a fascinating study, this mélange of misogyny, general misanthropy and pervasive malevolence. Though “In the Company of Men” has been called a dark comedy, to watch it unfold is to experience something much closer to moral tragedy. Chad – played with cool aggression by Jordan Brown – sees hostility and abusers all around him – in the injustice of office promotions and dismissals, in the ingratitude of a wife who has just walked out on him, indeed in the common way women exploit men and then toss them aside like expired meal tickets. In the only secure environment the world affords a guy, the men’s restroom, Chad goes on a rant about women to his co-worker Howard, whose girlfriend has just broken off their engagement. Chad proposes a brilliant stroke of vengeance: They find some plain Jane who’s never even had a guy look at her, and begin a carefully measured set-up to make her believe both men have fallen in love with her. When she has completely bought in and stands at her most vulnerable – bam! – they drop this dog, leaving her with her bleeding heart in her hand. Let her see what it feels like, this agony that women routinely inflict upon men. There’s a sort of incidental circumstance in all this: Chad and Howard went to the same business school; and though Chad graduated first, Howard is now Chad’s boss – at least on their current project. Howard – serious, quiet, slightly deferential in Brennan Roche’s apt portrayal – insists they’re really just colleagues and pals. But no, says Chad, his buddy Howard has earned his stripes. The relationship is what it is, and it’s all good. The boys find their mark in a new girl at the office. Christine is sweet, not unattractive, already prized as a good worker despite the handicap of her deafness. Deaf! An unexpected bonus. Christine will be perfect for the kill. That’s when comedic Cupid steps in as single-minded, one-dimensional Chad finds his blood-lust shifting into that other, more sympathetic boy-girl kind. And that’s where Jordan Brown’s vengeful character becomes complex, unsettled, harder to read. But wait a minute. Howard’s also falling for this lovely girl. Now we’ve got some comedy going as the boys ramp up their pursuit – separately, even unbeknownst to each other. Suddenly, Christine is blossoming. Her struggling speech even ceases to be a problem as both Chad and Howard learn to listen. There’s so much more to this girl than her faulty vowels. What guy wouldn’t succumb to Jessica Honor Carleton’s smart, witty, genuine Christine? It’s a joy to watch Carleton’s closed, self-conscious deaf girl open before our eyes like a tulip in early spring, to become radiant and glorious. And vulnerable. This Christine is funny. She loves a good joke, even on herself. Did you hear the one about the deaf guy and the peg-leg? But you can see the awkwardness, with these two guys – these two buddies – both flipping out over the same girl. Chad now wifeless and understandably reeling, Howard still hurting from his ex-fiancée’s betrayal. Somehow, Christine must choose. What else can she do but follow her heart? It’s just one of those situations, the eternally re-forming triangle, where someone always ends up getting hurt. Or possibly two. 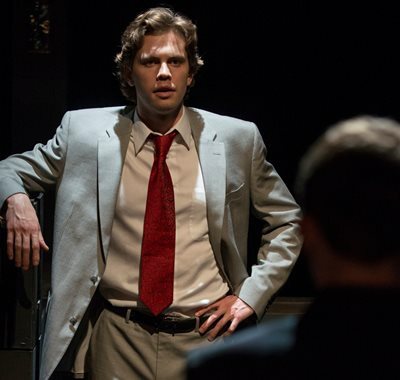 This show is a piece of work, charged by director Rick Snyder with the tension of a murder mystery and raised off the page into palpable life by three skilled actors. The end comes with a pair of twists, the first as from an unseen knife, a switchblade; the second in shouted vowels and consonants that make no sound at all.